Brick Town Talk: Inspiration of the day- 4-1-12 - LEGO Town, Architecture, Building Tips, Inspiration Ideas, and more! These days inspiration always seems to be from the world around us, and sometimes, just our imaginations. But sometimes, it's nice to take a dive into the imagination of another person. 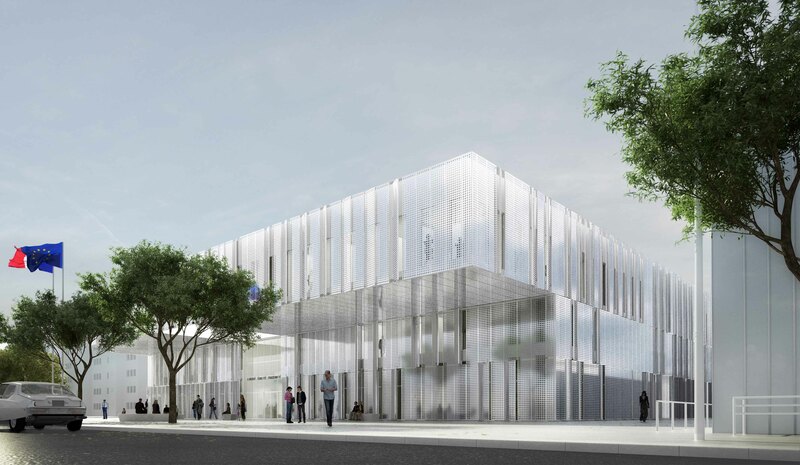 This excellent concept image of the Cité Municipale de Bonneuil-Sur-Marne shows many great concepts, while keeping a modern, restrained facade, and showcasing the inside with its glass exterior. It creates a great flow, between the interior working space, and the exterior, natural world. The building helps define the landscape, showcasing man's ingenuity, while still showing appreciation of mother nature.